(e) if so, the details thereof? *Necessary approvals for this SAG level post are being obtained. c) The total revised strength of the cadre is 2792. (d) & (e): Yes, Sir. Store Keeper Grade-I has been re-designated as Senior Store and Revenue Assistant (Pay Band-I, Grade Pay ₹2800/-). Store Keeper Grade-II has been re-designated as Store and Revenue Assistant (Pay Band-I, Grade Pay ₹1900/-). The posts of Meter Reader (MCM) and Meter Reader (HSG) shall be re-designated as Senior Store and Revenue Assistant (Pay Band-I, Grade Pay ₹2800/-), whoever opt for the same, otherwise they shall be allowed to be in the same category and will be wasted out through superannuation. The post of Meter Reader (SK) shall be re-designated as Store & Revenue Assistant (Pay Band-I, Grade Pay ₹1900/-), whoever opt for the same, otherwise they well be allowed to be in the same category and will be wasted out through superannuation. Store Keeper Grade-I has been re-designated as Senior Store and Revenue Assistant (Pay Band-I, Grade Pay ₹2800/-). 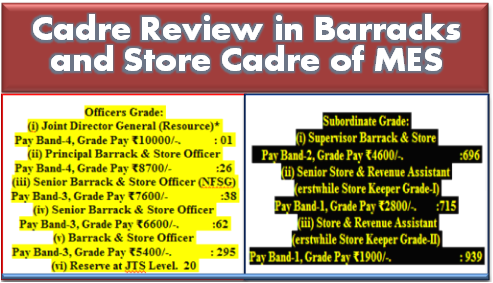 Store Keeper Grade-II has been re-designated as Store and Revenue Assistant (Pay Band-I, Grade Pay ₹1900/-).